Mike Kight knows a thing or two about pizza. As one of two owners of Pizza Pipeline — a franchise with locations spattered around Spokane and as far away as Corvallis, Ore. and Bellingham, Wash. — he knows that the perfect combinations of the right cheeses and the right sauces, and maybe some meat and veggies, can result in some pretty great pizza. And he knows that almost nothing enhances the deliciousness of said pizza more than a cool pint of beer. “Everybody likes pizza and beer,” he says, chuckling. 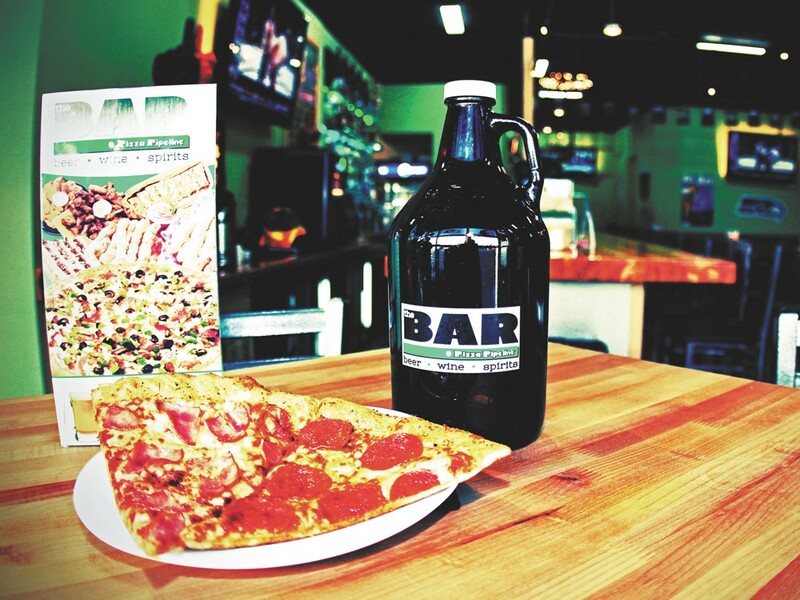 That was the motivation behind opening The Bar @ Pizza Pipeline, an extension of the Gonzaga-area Pizza Pipeline shop. But it’s not just a bar, Kight points out. It’s a spot for guys catching the game and families with kids, too. On a weeknight last week, the simple mint-green space was half full: families with kids sipping from plastic cups, a group of guys having pints and pizza and a collection of college-aged girls in Ugg boots chatting up the bartender from their barstools. The bar features the same pizzas that have made Pipeline a local institution, but throws in a few extras that are exclusive to the sit-down location. Like nachos ($8.49), maple bacon sticks (10 for $5.50) and the breakfast pizza ($1, slice; $8.50 whole), a pie topped with eggs, bacon, sausage, ham and cheddar cheese that is served on Sunday mornings. Behind the bar, a Parrot Ice slushie-type machine churns smooth margarita and daiquiri mixes — which Kight says some bartenders like to top with whipped cream-flavored vodka. There are also 20 beers on tap, and a laundry list of bottled beers. Kight says word is catching on quickly about the new spot — especially with the opening of college basketball season. And, I mean, how many other places let you eat pizza in the morning?